FBN’s Lori Rothman breaks down the latest weekly jobless claims data. 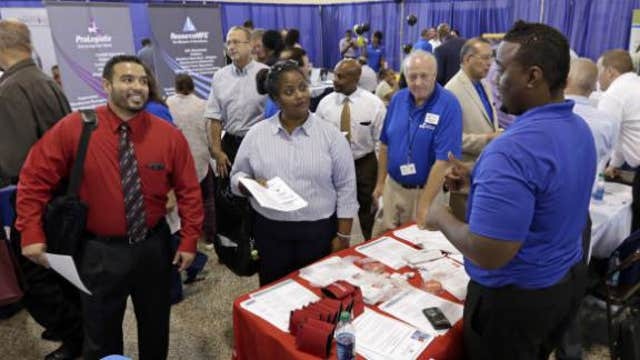 The number of Americans filing new claims for unemployment benefits rose more than expected last week, but will probably do little to change views that the labor market was strengthening. Initial claims for state unemployment benefits increased 21,000 to a seasonally adjusted 311,000 for the week ended Aug. 9, the Labor Department said on Thursday. The prior week&apos;s claims were revised to show 1,000 more applications received than previously reported. Economists polled by Reuters had forecast claims rising to only 295,000 last week. Claims are settling down after some volatility in July related to the annual automobile plant shutdowns for retooling. A Labor Department analyst said there were no special factors influencing the state level data. The four-week average of claims, considered a better measure of labor market trends as it irons out week-to-week volatility, rose 2,000 to 295,750, still pointing to firming job market conditions. A significant decline in layoffs, which has pushed claims down to their pre-recession levels, has been the major driver of an improving job market. But hiring is also gaining traction. A report on Tuesday showed hiring rose in June to its highest level since February 2008. The number of job openings that month was the highest since February 2001. The strengthening labor market picture has some economists betting on an early interest rate hike from the Federal Reserve. The U.S. central bank has kept its benchmark interest rate near zero since December 2008 and has shown little sign of being in a hurry to start tightening monetary policy. Fed Chair Janet Yellen argues that there is still slack in the labor market, citing tepid wage growth and a large number of long-term unemployed Americans and those working part-time. The jobless claims report showed the number of people still receiving benefits after an initial week of aid increased 25,000 to 2.54 million in the week ended Aug. 2.